The HP LaserJet P1505 is surprisingly fast with speeds of up to 24ppm, and a quick first page out in less than 6.5 seconds. Other printers need time to warm up before printing the first page, but with no-wait Instant-on Technology your first page will print in half the time. The 250-sheet adjustable main tray provides ample paper volume for an individual or small work team. For even greater cost efficiency, share the P1505n printer with more than one person. This model comes with basic integrated networking capability and PCL5e support, so you can quickly and easily connect as many as five users. With the HP Easy Printer Care software, you can perform multiple tasks with one tool: easily view the status of one or multiple printers, set up printer and supply alerts to your liking, generate basic usage reports, and reorder supplies. 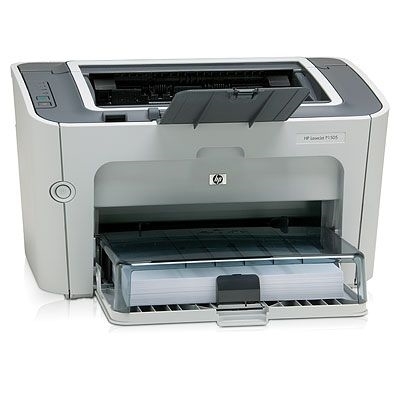 The HP LaserJet P1505 is ideal for producing effective business communications in a home office or in a workplace environment. (H X W X D) Unit 8.9" x 14.9" x 9.6"